When you harvest the last card in a field, follow these steps in this order. Draw until you have four cards in your hand. At this point your turn is technically over. 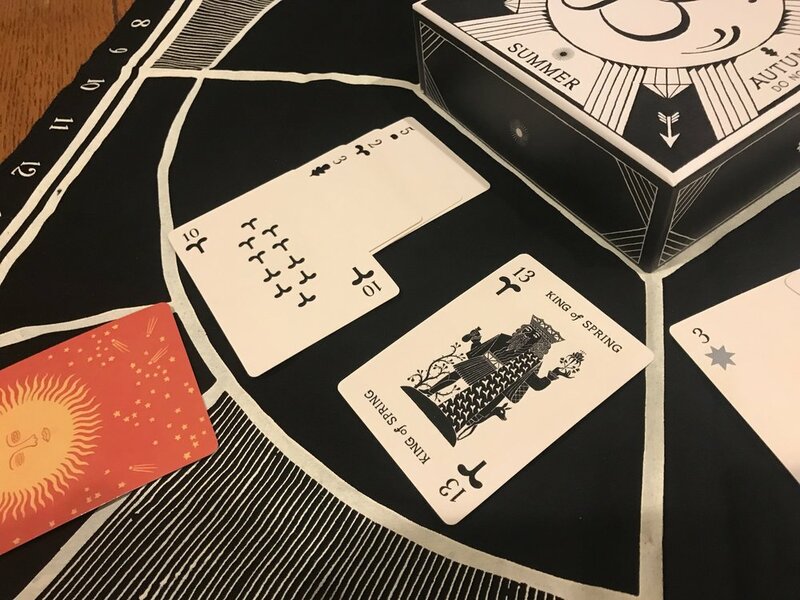 Are there any okuses on the Illimat? If so, take any one of the okuses. Is there a revealed Luminary in the corner of the field? If so, add it to your score pile and resolve any effects it may have. If there is an unrevealed Luminary in the corner of the field, flip it over to reveal it and resolve any immediate effects, if possible. When less than tree cards remain in the draw pile, discard the unrevealed luminary card. Q. When I clear a field with a revealed Luminary, do I collect both the Luminary and an okus? Q. I revealed The Children, which instructs me to place three cards under the Luminary. But there's only one card left in the deck. What do I do? A. If you cannot meet the conditions of the Luminary - whether it's placing three cards under The Children or having six cards in the field of The River - discard the Luminary. Stockpiling is a difficult move to master, but it’s absolutely worth it. It opens up a host of strategies and provides opportunities for huge harvests. And if you neglect utilizing the stockpiling function, you may be frustrated with a lack of options for lower valued cards. When you stockpile, you play one card in your hand and combine it with one or more cards in a field to create a fused stack to be harvested on a later turn. When you stockpile, you utilize two cards in your hand. The active card is the one card that you play from your hand and combine with one or more cards in the field. You are also required to have a passive card in your hand - a single card with a value matching the stockpile you are creating. In our Single Stockpile example, the three of Autumn is the active card. We're making a stockpile of ten, so the ten of Summer is the passive card. You combine your active card in your hand with one or more cards in the field to create a fused stack. The cards in the fused stack must add up to the value of your passive card. When stockpiling, set all the cards in field in a vertical row so their value can be seen. A single stockpile is treated as if it is a single card with a value equal to the combined value of all cards in the stockpile. The individual cards in a stockpile can’t be separated or swapped out. The active card is a three, the passive card a ten. The three is combined with the two and the five in the field to stockpile to make a ten. You cannot harvest a Stockpile as part of the same action you use to create it. In future turns, any player can harvest it - so when you create a stockpile, there’s always a risk that someone else will harvest it before you have the chance. You may combine the single stockpile with other cards in the field for purposes of harvesting. If there’s a single stockpile with a value of ten and there is also a four in the field, you may harvest the 10+4 using a fourteen - just as if the stockpile was a single card with a value of ten. You may stockpile further onto the single stockpile to change its value. In our example above, someone could stockpile a three from their hand with the stockpile of ten we made to change its value to thirteen — provided of course that they had a thirteen in their hand as a passive card. This is an example of a multiple stockpile of tens. You can combine the active card in your hand with one or more cards in the field to create a stack that has multiple iterations of a single value… the value of your passive card. In the example shown, the active card was the ten, and it's been stacked with the other three cards to create two separate sets with a value of ten. There is no limit to the number of cards that can be in a multiple stockpile, and you could have four or five different combinations of ten in the same stockpile (as long as you have a passive ten in your hand). To indicate this, set one or more card matching the value of the stockpile at a right angle to the stockpile, as shown in the image. You can only harvest a multiple stockpile using a card with the same value as the stockpile. If the multiple stockpile has a value of ten, you can only harvest it with a ten. You cannot combine it with other cards in the field to create a new value - so you cannot use a Fool from your hand to harvest a four and a multiple stockpile of tens, as you could if it was a single stockpile. The only thing you can add to this multiple stockpile is a ten. The only thing you can add to a multiple stockpile is additional cards of the same value. You cannot change the value of the stockpile by adding new cards. So with the stockpile of ten, you can add another ten to it - but you can’t add a four to make it a fourteen. As the stockpiling player, you reveal your four as your active card. You combine it with the two and the three to create a single stockpile with a value of nine. You then add the nine that was already in the field to your stack, to create a multiple stockpile locked in at a value of nine. … Add an additional iteration of value to a multiple stockpile (Stock 10 x 2 + Active card 10 = multiple stockpile of 10 x 3). In all of these cases, you must have a passive card in your hand that matches the value of the stockpile you are creating or adding to. Q. Do I have to reveal my passive card? Can I lie about it? A: When you create a stockpile, you are implicitly announcing to the table that you have a single card in your hand that can harvest the stockpile. If you don’t, it is an illegal play and you’re cheating. You don’t have to reveal this passive card unless someone asks to see it. If someone asks to see your passive card, you must reveal it. Q. Is there any limit on the value of a stockpile? A: A stockpile cannot have a total value higher than fourteen, because the person creating the stockpile must have a single card in their hand that can harvest the stockpile. Q. If The Union is on the table, can I create a stockpile with a value greater than fourteen, because I could harvest it using two cards from my hand? A; No. The Union allows you to use two cards from your hand when you take the Harvest action. This doesn’t change the restriction on Stockpiling that you must have a single passive card in your hand that matches the value of the stockpile. Q. I created a stockpile, but by the time my turn came around there was an exciting new opportunity. Am I required to harvest the stockpile? A: No. You must have a card in your hand that can harvest the stockpile in order to create it. But you’re not obligated to harvest that on your next turn, or ever. There is no limit to the number of cards you can have in a single field. You can always sow a card into a field, unless the season of that field is Autumn. At the end of the round, you total all positive points from the round and apply them to your score on your scoring track. Next, apply the Frostbit penalty. You cannot go below zero on the scoring track due to being Frostbit. If a player ended a round with two Fools (one point each), an Okus (one point), and Frostbit (loss of two points) they would score a total of one point for the round. 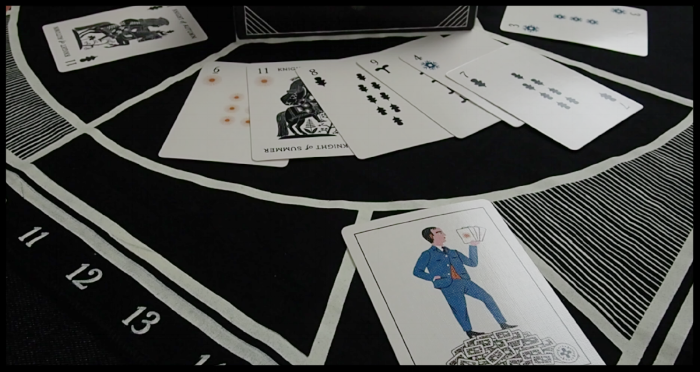 At the start of a round, each player places one okus token on top of The Illimat. 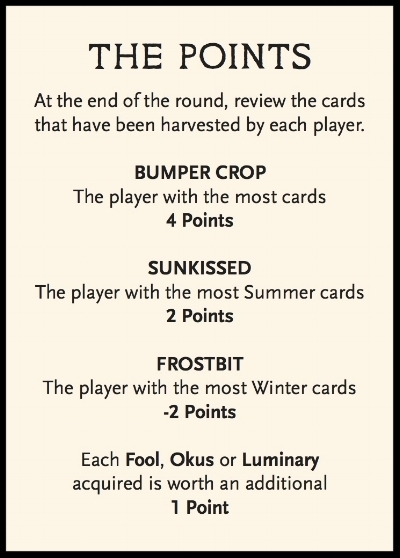 Once they are on the Illimat, these tokens aren't tied to a specific player; when you clear a field, you can take any okus token you wish from the Illimat. 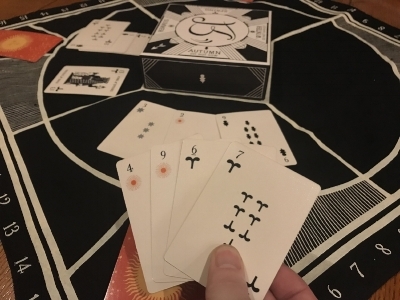 Traditionally, an okus is an object with some personal significance to the player who puts it up, and we encourage experienced players to bring their own okus token to the Illimat. Your copy of the game comes with four metal okus tokens to get you started. They depict a bear tooth, an ancient chess pawn, a boat, and a bathtub. Regardless of who takes them during a round of play, all okus tokens are returned to their owners at the end of each round.